Most journeys require us to make stops along the way. I had such a need, maybe more of an invitation, to “come apart and rest for awhile” this week. A group of us who have been meeting for 10 years to muse and to pray took our annual retreat at Casa de Maria (House of Mary) Conference Center, in the centerpiece house (in some ways the Mother House) Immaculate heart Center, to reflect and pray with Anne Lamott’s book Stitches. We drove into the beautiful grounds through an alley of trees, turned into the driveway to which the open-armed Jesus pointed us, and rang the doorbell. Even though we have been there before, the opening of the door, the soft voice of welcome and the stone walls layered with the prayers of the faithful and unfaithful, the seekers and the long-time practitioners, the desperate and the certain, made as aware that we had come into sanctuary for the restoration and the replenishment we needed. We have come to call ourselves the Ammas, after those mothers of Spirit so long ago who went to the desert to seek to become closer to the Holy One. What we found once again on this retreat was that we were there to receive the mothering care of God in the retreat center itself and in one another. The quiet and gifted staff offered us beautifully appointed beds in which to sleep, spacious windows for enjoying either the light coming in or the Tiepolo sunset over the ocean. The flowering of many plants, the flowing of the streams, the polyphonic bird calls, the buzzing of bees, the scent of fresh air and old oaks brought back memories of earlier days or introduced us to new facets of God’s creation which we had never known were there. The meals imagined and implemented by the Amazing Teresa and her crew likewise satisfied and nourished, even as they introduced us to tastes and textures that we had not imagined heretofore. It was a cradle of Grace and Blessing! In addition to the place, we also found that we were mothers to one another. Lamott’s second chapter is called “The Overly Sensitive Child.” Not all of us would characterize ourselves that way, yet in remembering our childhoods. our earlier years, over the hours together, some of us became aware of the joys we hold close, the paths from which we have separated, and the wounds we have still carried. We are all grownups now, but in our hours of listening and pondering together, we were able to offer one another some affirmations for each one just the way she is; to weep with one another; to hug and to hold those who mourn; and to laugh uproariously with delight in each other. Although we are all mothers ourselves, grandmothers most of us, we played with scissors, paints, gluesticks, coffee filters, and Magic Markers. We sang together “How Can I Keep From Singing?” We held quiet space after hearing a sacred memoir. And we prayed—for those we love, for our communities, for the world, and for ourselves. In part it was hard to leave, but another part was ready to go back to the flats where we work and love and are Christ’s hands and feet in the world. Yet, we left knowing that we had been mothered by the Spirit is a way that had fed us for the journey and strengthened us for the days ahead. 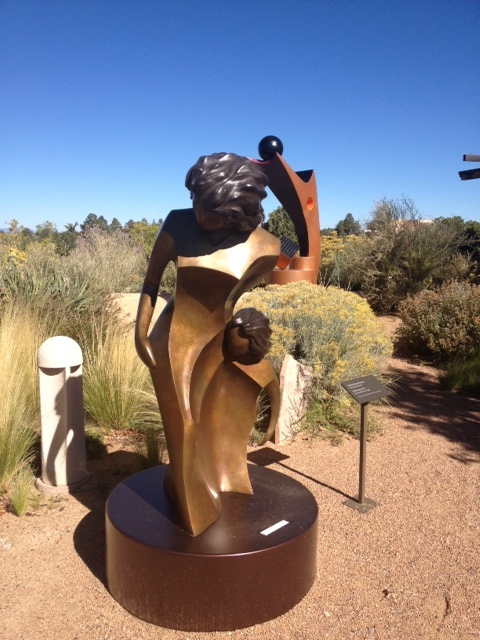 As we left I remembered in my mind’s eye the sculpture I had met in Santa Fe last Fall on the Museum Plaza called “Mothering.” The Mother holds her child close to her, bringing her into the the wonder and work of the world that lies before her. I felt refreshed and accompanied to go with her after this Rest Stop. I re-enter my work, play and love with a grateful heart! A beautiful call to the rest of us to go and do likewise. Rest and reflection get so little time and space in today’s world. Thank you, Elizabeth!